I vividly remember the last day of my mother's life. As a family, we sat vigil around her hospital bed. Although she experienced few moments of consciousness ~ when we were aware she was really with us ~ we shared precious words of love and gratitude for her life well-lived. We knew it was her last day and these would be the last things we talked about with her, as her body finally could no longer support life. It was a precious time ~ a holy time ~ to be present as she left her broken earthly tent and enter her eternal rest. I also remember the final twenty-four hours of my son's life. Scott wanted to hang out and talk about something he had on his mind. We never in our wildest dreams would have thought that it would be the last thing we talked about. Scott sat in the oversized chair in the living room, his long legs swung over one armrest, and his hands cradled behind his head. He asked a most profound question ~ So, where was Jesus between Good Friday and Easter? I know his body was in the tomb ~ but where was HE? We spent time looking at Scripture. We talked about the Apostles' Creed and the hope that is in us. We talked about Holy Saturday, those hours between His Death and Resurrection. We talked about the Harrowing of Hades when many believe Christ descended to break down the gates of Hell. Little did we know that it would be the last thing we talked about ~ for the next day, Scott himself would enter his own eternal rest. Today is Holy Saturday ~ it is the day between the grief of Good Friday and the hope of Easter. And I find myself reflecting upon that final conversation with Scott. Did Scott somehow sense his own mortality? 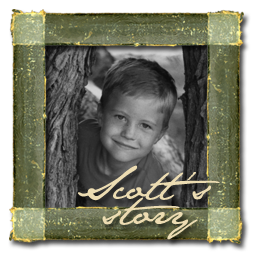 Did the Spirit place these thoughts on his heart, knowing that in God's sovereign plan, Scott's life would soon hang in the balance? Whatever the reason for that conversation that night, the last thing we talked about now brings a smile to my face and joy to my heart. For it was during these hours, when Christ's body lie in a cold, stone tomb, that Scott's future, my future, indeed, the future of the world, was truly redeemed.